In an effort to raise awareness for The Keg Spirit Foundation, President and CEO, David Aisenstat will be climbing Mount Kilimanjaro with a close-knit team of Keg supporters. The team will embark on the adventure of a lifetime, heading for the summit of Mt. Kilimanjaro at 19,341 feet above sea level. Ascending the world's tallest freestanding mountain will take the team from the plains of Tanzania, through rainforests and into the glaciers surrounding the summit of Mt. Kilimanjaro. The group will then descend the mountain and head out on five action-packed days on safari. The Keg has a long history of charitable giving and in 2001, The Keg Spirit Foundation was established to commemorate The Keg's 30th anniversary. While the Foundation concentrates on supporting charities that focus on the development of children and youth, its specific goal is to recognize organizations that mirror the mentorship that The Keg Steakhouse & Bar has provided to so many young people. Their goal is to raise $20 for every foot they climb for a total of $386,800. All proceeds will be donated to youth charities including Big Brothers Big Sisters, Free the Children, Youth in Motion's Top 20 Under 20 program, the Ladybug Foundation Education Program, and the Duke of Edinburgh's Award . With our exceptional guides and Chagga staff, this promises to be the experience of a lifetime. Stay tuned for updates on this excellent adventure. August 16, 2010 – Arusha Coffee Lodge, Arusha, Tanzania: We Are Done! August 15, 2010 – It's Uhuru Peak or Bust! It's Summit Day!! 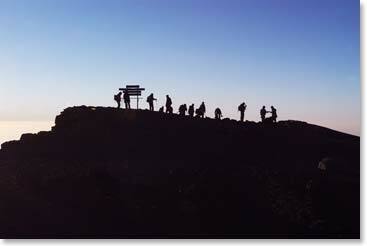 August 15, 2010 – The Whole Team Stands On the Summit of Kilimanjaro! August 12, 2010 – Karanga Valley Camp, 13,200ft/4023m, Separation Day, Not. August 8, 2010 – Big Tree Camp: The Journey has begun!! August 8, 2010 – We Are Off! !